Decorate your computer screen with beautiful flags of the world waving in the wind. All 3D animated flags in one screen saver, including Canadian, Australian, American, England, Pirate (Jolly Roger), Confederate (Rebel) and more. Download flag screen saver for Windows 7/8, Vista and XP desktop. 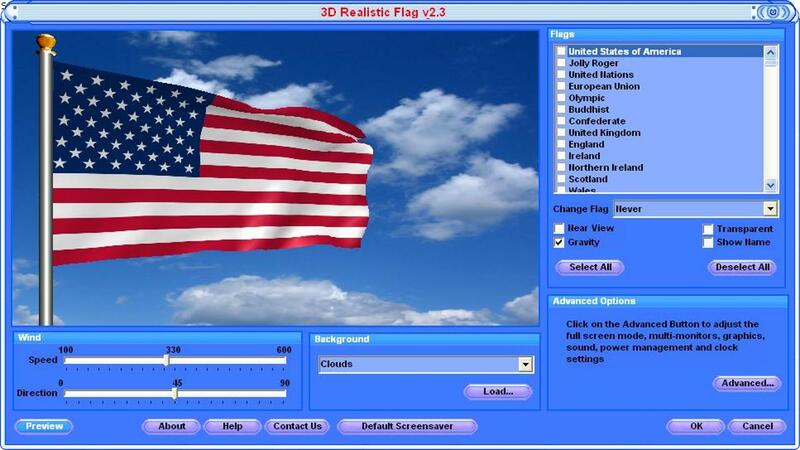 Download Flags Screen Saver and choose from USA, UK, Australian, Canadian and 230 national, patriotic, historical and international 3D flags of the World to enhance your Windows desktop background with realistic animated flag screen savers. All are free (incuding American flag) to download and try. 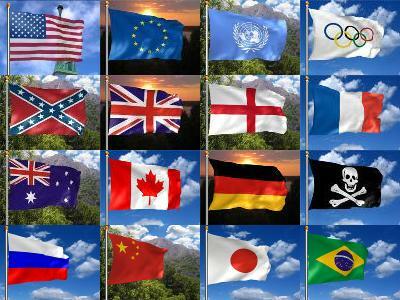 Waving Flag screen saver includes not only an American flag and 3D flags of Australia, Canada and England, but a rebel flag and 230 national, patriotic, historical and international flags of World. Bring the patriotic spirit and national pride of a proudly flying and waving flag on a flagpole blowing in the wind in support of your country. You can choose from colorful flag backgrounds have been included in 3D screen saver (Sky, Sunset, Mountain and Statue of Liberty) or download your favorite background pictures or photos. Customize the waving flag options, selecting the wind direction and adjusting wind speed from a gentle breeze to a strong wind. View option allows you to display selected animated flags with their country or historical names and set the replacement time of flown flags too. The screen saver includes digital clock and calendar, which can be displayed at the bottom right corner of computer screen and help you keep track of time during the day. Advanced options of the 3D screen saver allows you to fly flag in any day time and on most computers including laptop or office computer. Your laptop or PC will work longer with advanced power management options. Multi-monitor settings allows to display animated flags on 2 monitor or 3 monitor systems and plasma TV set in standard 4:3 screen or 16:9 widescreen. Designed to be used as animated flag background for all versions of Windows, including Windows 7/8, Vista and XP. A small file size makes the screen saver an easy download to your computer. When you buy, full version can be downloaded immediately. A small file size makes it an easy download to your computer desktop. Our ecommerce providers ensures that you get your full version as soon as possible, making purchase based on your own familiar currency and payment method. Removes any limitations of the demo version.